Many of you like me loves Amazon lightning deals and offers. But these types of deals are available only for a short period of time. So you keep on looking for price drops so that you can buy your favorite product as soon as possible. Nobody wants to pay extra penny out of their pocket when there are chances to save them. But who has so much time to do a constant watch for price drops. Luckily, there are several tools available on internet which will help you find the best price for your products. I have checked several price tracking tools in the market and found some best ones for you. 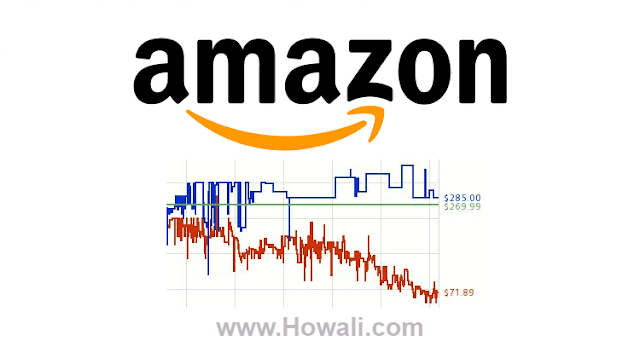 Today I will show you 7 best Amazon Price Tracker Tools which will help you in tracking price drops for your desired product on Amazon. Using one of these tools I have tracked price drop for laptop and purchase a Lenovo G50-80 for my blogging use. I have also compiled a list of 7 best laptops under $1000 you might find worth reading. Slickdeals is a most popular website which gives you an option to watch for discounts, coupons and other types of deals on the internet. They also have a web-based tracker which will help you to track price-drops for any products sold on Amazon.com. You just need to create an alert for the product you want to watch and Slickdeals will send you an email if the price drops below the threshold you had set for that product. CamelCamelCamel is another great website to get discounts and track prices for products sold on Amazon. You can install the browser extension Camelizer ( For Mozilla Firefox, Google Chrome and Apple Safari) and add price history charts to your browser using this addon. It provides an option to view price history of over 18 million Amazon products. You have to simply create Amazon price watch for your desired product. Whenever the price drops they will send you an alert via Email and Twitter. It is one of the best tool in my experience. Keepa is an easy and most efficient Amazon Price Tracker tool. It has a huge product database with historical price-graphs. You can tag an item on Amazon and keep it on watch and they will offer alerts via email when the rate drops. It’s browser extension will display price history graph on each Amazon product page. It is optimized for Mozilla Firefox and Google Chrome browser. It mainly focuses on Amazon.com products. PriceJump is a a service made by Savings.com to track price changes on Amazon. It is one of the most popular Amazon Price Tracker tool. You have to simply copy the Amazon product URL and paste it on PriceJump search box. You can compare price with several websites apart from Amzon.com. You can compare real-time price using their app with more than 5000+ retailers. You can download their iOS app from the Apple Store. They have browser extensions for Mozilla Firefox and Chrome at the time of writing this post. Safari extension will be coming soon. CheapShark is another great website which focuses on products such as electronics, video games, apparels, appliances, etc. It is one of the best option to save money for people who loves video games. It compares prices with several websites which includes Steam, Gamersgate, Greenman Gaming, Amazon.com, etc. If you are looking for a simple price tracking website, switch on to The Tracktor. Their website is pretty simple and user friendly. It is another great Amazon price tracker tool which gives you email alerts whenever price-drops. It has a feature which shows historical price-drops of most popular products. Invisble Hand is one of the great Amazon price tracking tools which gets you the lowest price on shopping, flights, hotels, etc apart from Amazon products. It’s main feature is that it remains invisible until it finds a deal for a product you want to shop for. When you search on Google it will automatically provides you with real time price comparison. It also has a feature to reveal hidden prices. It has Addons for web browser such as Firefox, Chrome and Safari. So these were the 7 best Amazon Price Tracker Tools which will help you to track price drops and buy your desired product at the right time. Do let me know through comments how this post has helped you. Don't forget to subscribe to my email list and bookmark this post for future reference.